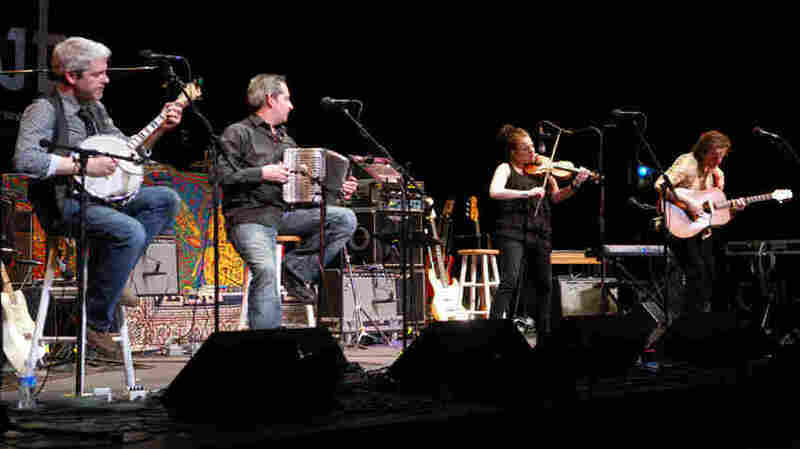 Solas On Mountain Stage The long-running band's take on Irish-American music is both traditional and contemporary. Seamus Egan, Winifred Horan and their current collaborators perform songs from their latest album, The Turning Tide. Solas performed on Mountain Stage. "A Girl in the War"
Seamus Egan and Winifred Horan founded Solas in 1996, and the band continues to tour and record its brand of traditional and contemporary Irish-American music. Here, Solas makes its fifth appearance on Mountain Stage since 2000, performing songs from The Turning Tide. The band puts as much enthusiasm and musicianship behind "The Ditching Boy," a Richard Thompson composition, and "Girl in the War," written by Josh Ritter, as it does with traditional numbers such as "Bird in the Tree." Mountain Stage house vocalist Julie Adams closes this set with a performance of her own. This segment originally aired April 15, 2010.